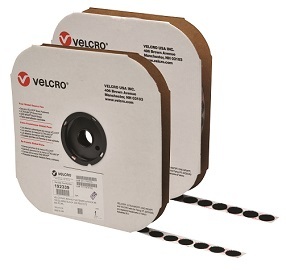 VELCRO® Brand VELCOIN® Fasteners are available in several different diameters with acrylic (0172) adhesive on the back. VELCOIN® fasteners are manufactured from hook#88 and loop#1000. Or can be custom converted to your desired size. Hook and Loop components are sold separately in the following widths: 3/8" 1800 coins per roll, 1/2" 1440 coins per roll, 5/8" 1200 coins per roll, 3/4" 1028 coins per roll 7/8" 900 coins per roll, 1 3/8" 600 coins per roll and 1 7/8" 450 coins per roll.